Nestled on the Alaska panhandle west of Juneau, Glacier Bay National Park is a terrestrial and marine sanctuary spanning more than 600,000 acres. While the park has no roads, it isn’t all that hard to get to. More than 430,000 people visit it each year, and many come on cruise ships that tour the park’s many tidewater glaciers. Glacier Bay calls to those who want to explore the Alaskan wilderness on their own terms. Backpacking and camping are popular among visitors who really want to rough it. Although there is a wide variety of visitor services outside the park(primarily in the town of Gustavus), the park itself has no marked trails and no roads. This can be a little intense for a first-time backpacker, but guided tours can be arranged by local outfitters. These are especially convenient for groups. Guided mountaineering and rafting trips provide unparalleled adventure — just make sure you’re ready for the challenges of isolation and fickle weather. Many visitors to Glacier Bay National Park enjoy it from the deck of a cruise ship. Tidewater glaciers, mountain scenery and even wildlife are viewable from the deck. Upon entering the park’s waters, some cruises have rangers board the ship to lead information sessions, host slideshows and walk around the decks answering questions. This offers an immersive, educational experience without ever having to leave the ship. Of course, if you want to take a closer look, you might want to try exploring the park by sea kayak. Adequate preparation, even for a single overnight trip, is of the essence. Tour vessels and charter boats also operate in the park. Should you happen to come ashore, seasonal ranger-led programming is also available at the park’s Bartlett Cove and main visitors centers. Glacier Bay National Park is open all year, but services during the winter are extremely limited. While the park charges no fee to private visitors,permits and reservations are required for activities like private boating, rafting and camping. Rafting on the Tatshenshini and Alsek rivers incur a fee and require reservations. Seasonal lodging in the park is available at Glacier Bay Lodge. Guest houses in the nearby town of Gustavus offer additional lodging in quaint bed-and-breakfast inns. If you come in the summer (as most visitors do), be prepared for rain. There are no roads leading into the park, so most people arrive by ship, or else fly in by charter plane. There are more than 240 bird species in Glacier Bay National Park, so its easy to spot many different kinds of birds, particularly near water during the summer months. Birds will nest along streams, tidal flats, rivers and coastlines in the park, benefitting from the ample food sources and lack of land predators in the region. The park’s website has a list of 15 popular spots for birding in Glacier Bay National Park. Other wildlife in the park include humpback whales, which often feed in the park’s waters less than a mile off shore. Colonies of sea lions and harbor seals can be seen on the coast, and sometimes black and grizzly bears will make appearances on the park’s beaches. Glacier Bay National Park encompasses the ancestral homelands of the Tlingit, an Alaskan Indian tribe that maintains communities in the park to this day. Tlingit oral history holds that theyinhabited lower Glacier Bay for millennia until about 300 years ago, when the glaciers moved in, covering their homelands in ice. The park is no stranger to sudden (geologically speaking) glacial activity. The very straits that cruise ships traverse today were completely covered by ice when the H.M.S. Discovery visited it in 1794. Yet naturalist John Muir found that the tidewater glaciers had retreated a distance of about 48 miles when he visited in 1879, not a century later. By 1916, another glacier had pulled back a distance of 65 miles from the mouth of the bay, making it the fastest known glacial retreat. While many of the glaciers in Glacier Bay are retreating, it’s not a unilateral condition. Scientists are now studying how glacial retreat relates to climate change. 1879 – Naturalist John Muir visits Glacier Bay, and finds that much of the ice has retreated. 1899 – A massive earthquake rocks the region, breaking off icebergs from Muir Glacier that effectively prevent steamships from navigating the waters of the bay for a decade. 1940s – U.S. Army bases, airfields and supply depots built near the park. Later dismantled by German POWs. 1925 – Glacier Bay National Monument established. 1978 – National monument enlarged by 523,000 acres. 1980 – Glacier Bay National Park established. 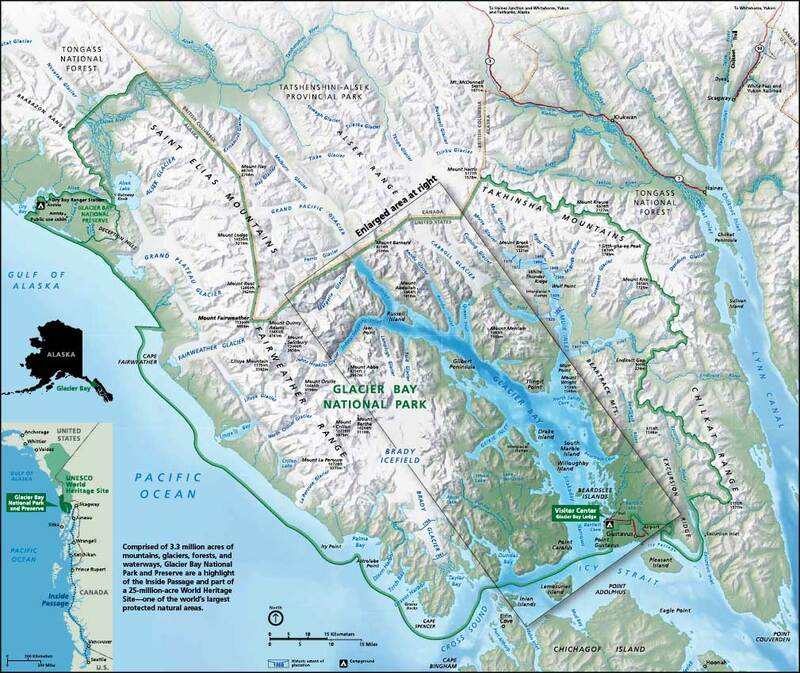 Click here for a detailed Glacier Bay National Park map.